My dad’s eagerness to sell Clark Brother’s integral gas engine/compressors to Tennessee Gas Pipeline caused him to sell them a compressor without valves. Dad promised Tennessee Gas that he would find someone to build Ingersoll Rand-type channel valves for the Clark compressor. That “someone” turned out to be Ernest Hotze himself and ultimately led to the birth of Compressor Engineering Corporation, which he continued to lead until his passing in 1995. During the spring of 1964, I vividly remember sitting with my father in the living room measuring all the parts of an Ingersoll Rand channel valve. I was using a vernier scale caliper to measure the parts and read the dimensions to dad as he neatly wrote them down on a handmade chart. Dad’s clear drafting, lettering and numbers impressed his children. As an Oklahoma University mechanical engineer, Dad knew he needed to find a foundry, pattern makers, steel suppliers, machine shops, punch pressers and specialized lappers. The first equipment we purchased was a hand-cranked rolling machine for valve springs. The young Hotze brothers would take turns rolling the springs, while another brother placed them into the rollers. Soon after, dad delivered the first official order of CECO channel valves to Tennessee Gas Pipeline. Tennessee Gas was so impressed by the sealing capabilities of the first lapped CECO channels, they ordered additional sets for their other Ingersoll Rand compressors. Dad had created a company that was selling spare parts for his biggest competitor’s compressor valves. How sweet that was. About 1967, we moved all of the production to the back of Rene Horvath’s shop on Heights Boulevard. It was a metal building with only a big fan to fight the Texas heat. Rene helped take orders and measure more compressor parts to produce. Sales increased. In 1970, a 10,000-square foot shop was built on Feagan Street. Horvath Precision Model occupied 25 percent of the Ho-Ho building. During this time, CECO purchased its first Spitfire lapping machine and Blanchard grinders. Clint Hager, a pillar in CECO’s history, came to work for dad from the valve and regulator department within Ingersoll Rand. Clint’s expertise allowed us to open the valve repair shop. In 1975 computers were installed to automate the business processes and heat treating equipment was installed for channels and for valve discs. CECO had many setbacks, but we kept plugging forward and dad’s company that started in the family garage became a worldwide supplier of compressor and engine parts. In 1976, Dad retired from Dresser Clark as a Vice President of Sales, and we began making Clark replacement parts full-time. CECO had outgrown the Feagan Street plant. We purchased the 20,000-square foot Gulf Aerospace building on Alder Drive. Soon after, we hired Art Black from Ingersoll Rand to be CECO’s Chief Engineer. Art turned CECO’s Engineering department into a first-class shop. In 1978, a CECO opened a New Orleans warehouse. Our Odessa repair shop was also opened and we sold more parts in the first months than our distributor did in the whole year. In 1984, an additional 35,000-square foot manufacturing and office building was added on to the Alder Drive office. The eminent engineer James R. Hutton joined us in 1986. The 1990s saw the acquisitions of Anderson Consulting, Testing and Training and the Ball Valve company. By 2003, CECO purchased LDI Contractors in Birmingham to form CECO Pipeline Services, now a growing, dynamic business. Parts Maintenance Inc. in Baton Rouge became a CECO Precision Repair Center. The Baton Rouge and New Orleans locations combined in a new building in Walker, Louisiana, in 2009. 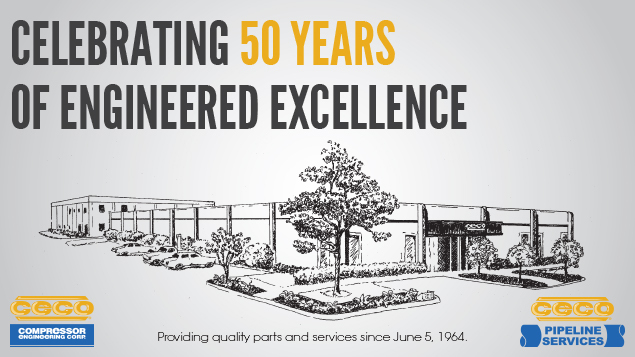 CECO has changed over its first 50 years to meet the needs of our customers and we will continue this tradition of change and improvement throughout the next 50 years. Our mission is for CECO’s products, services and processes to meet and exceed our customers’ needs and expectations. I give many thanks to all the bright, ingenious and hard working CECO associates that have made dad’s company such a successful and highly-regarded corporation in the oil and gas industry. The Hotze family is eternally grateful to all of our CECO Family that has made these 50 years possible.